I know, I haven't been around in a while. I broke my foot and am finally back at work and everything has been crazy since I found out I was going back, so I was slacking on my nail stuff. I do have a few posts for you the rest of this week and I'll hopefully be back to normal soon! Today I have some Indies to show you! 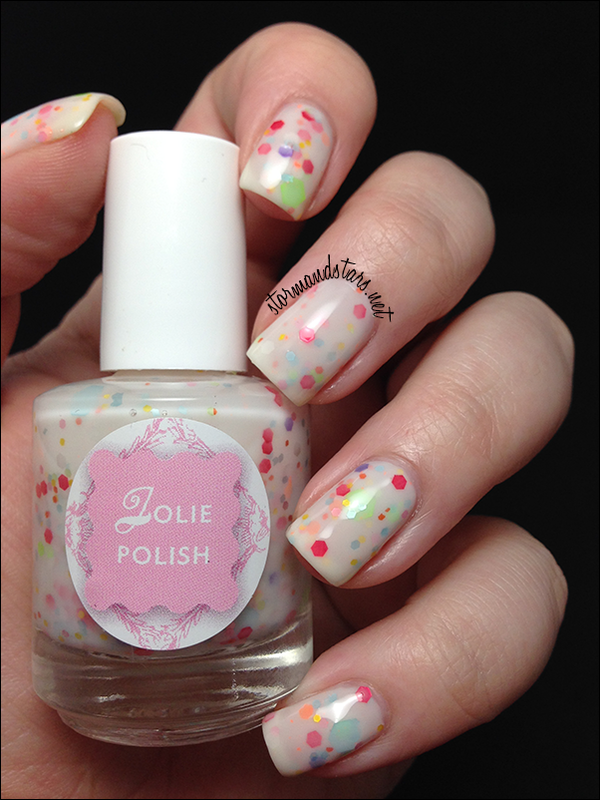 Bory from Jolie Polish contacted me to review her polish and since her colors are so pretty and she is sweet as pie, I absolutely said yes! 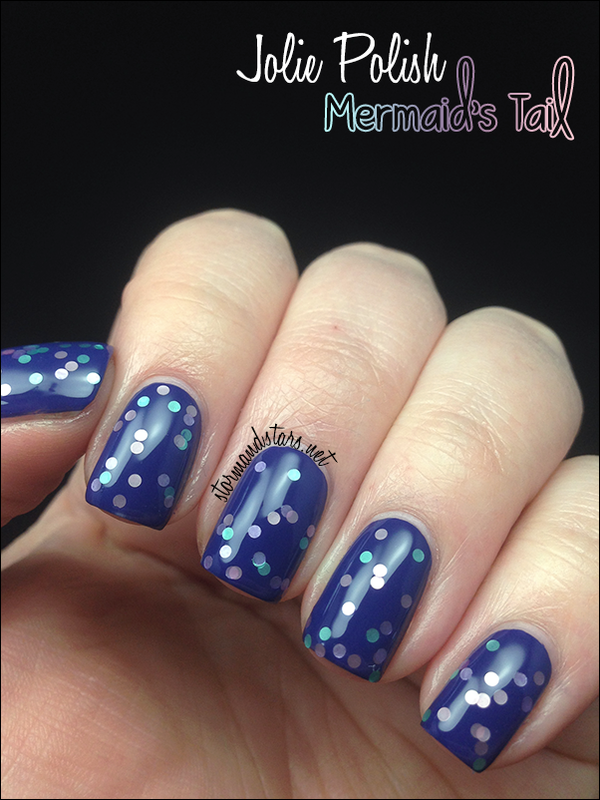 I have four lacquers from her Mermaid Collection and one extra to show you today. First up is the odd one out of the bunch that is not part of the Mermaid Collection. This is Choji. 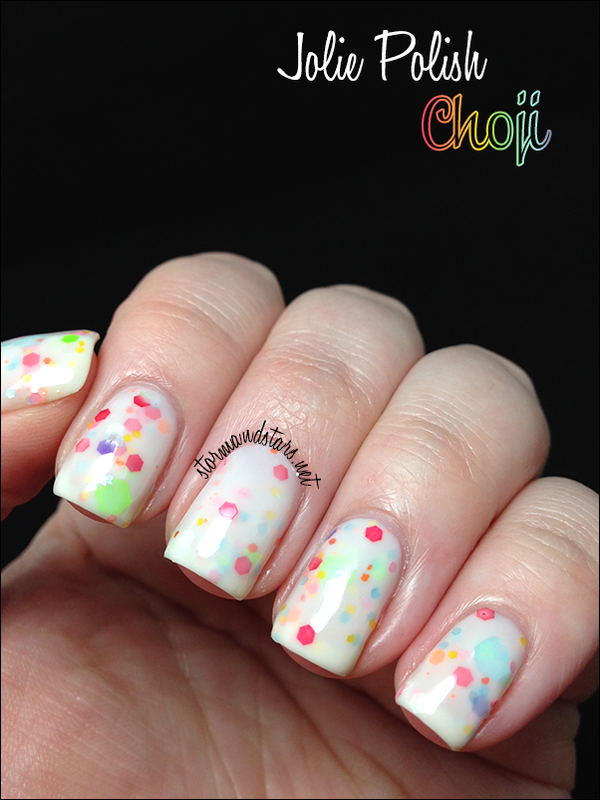 Choji is a white cruelly based polish with multi sized and colored glitters throughout. I really loved the formula on this one and it was so cute on. The colors are really bright without really being neon and its just really nice to work with. These photos are 3 coats plus topcoat. Next up is the one I had a hard time finding a base color I wanted to photograph it over. I wanted it to be perfect for the photos. Here is Mermaid's Tail. 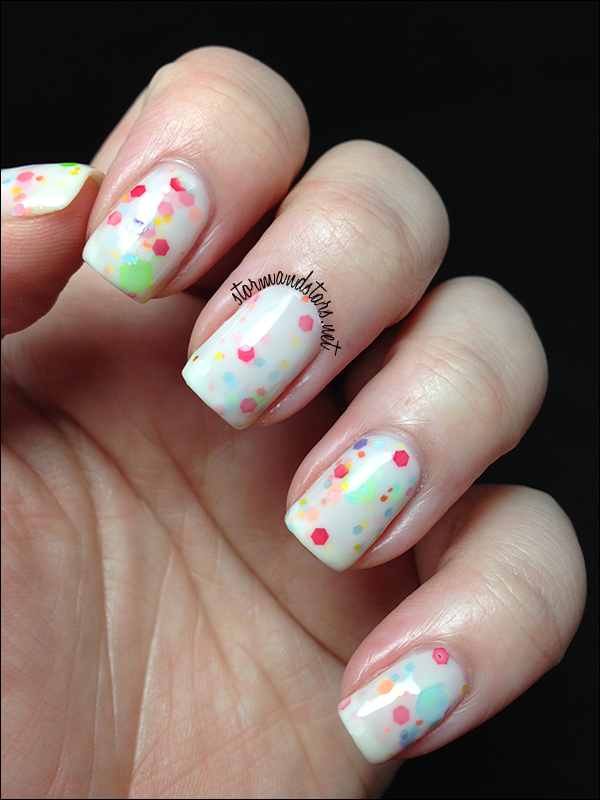 I love circle glitters, and these satin pastel cuties are just so soft and pretty. 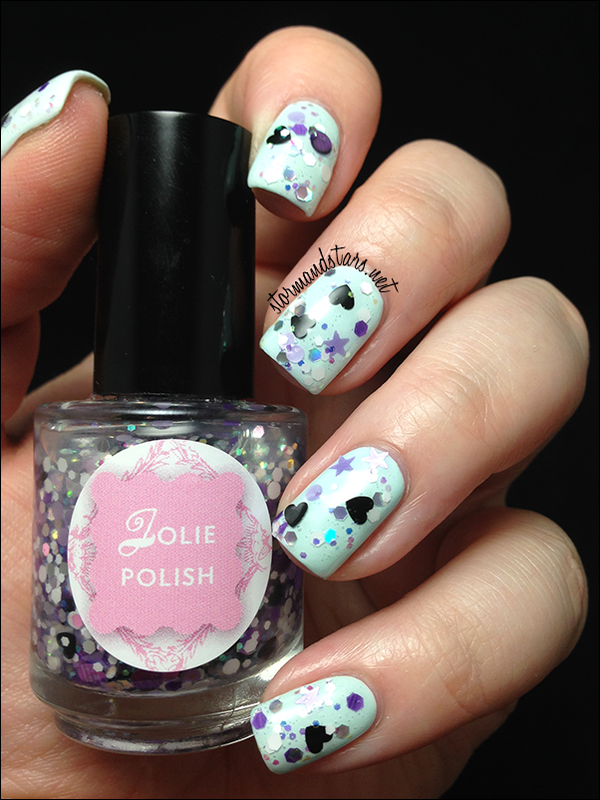 Mermaid's Tail is a clear base with circle glitters in pastel pink, purple and teal. I used one coat here over Cult Nails Wack Slacks and I love how it turned out! The base was a tad thick on this, so I may thin it next time, but it wasn't really a problem as you can see! The next lacquer is easily my favorite of this collection and is even one of my favorite polishes now. It may even be my all time favorite glitter topper. Here is The Heartbreaking Mermaid. With me, you can't go wrong with stars, purple and black. This one hits all the right buttons for me and I absolutely love it!! There are so many different glitters in here that I don't even know where to start. 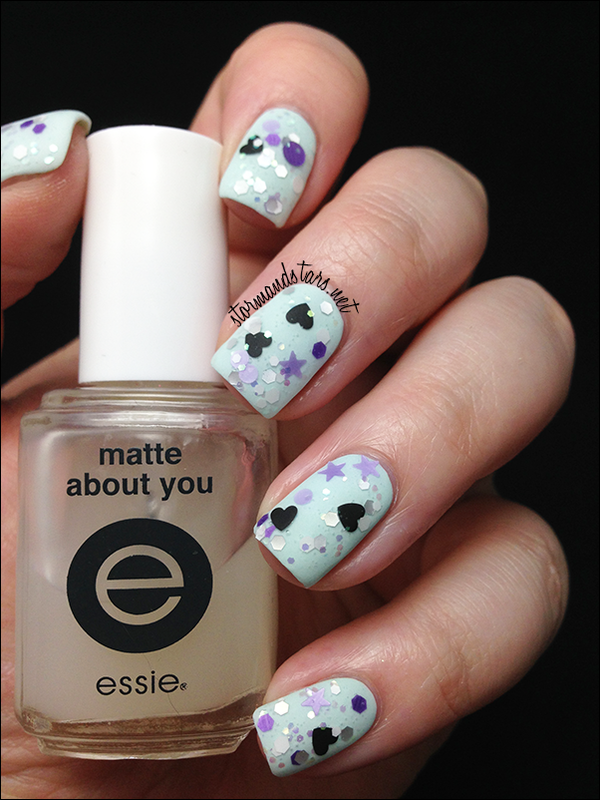 From huge purple circles to iridescent hexes and those fabulous purple hearts, this baby is GORGEOUS!! For these swatches I layered The Heartbreaking Mermaid over Polish Me To Go - Oh Cool Blue then added topcoat to smooth everything out. 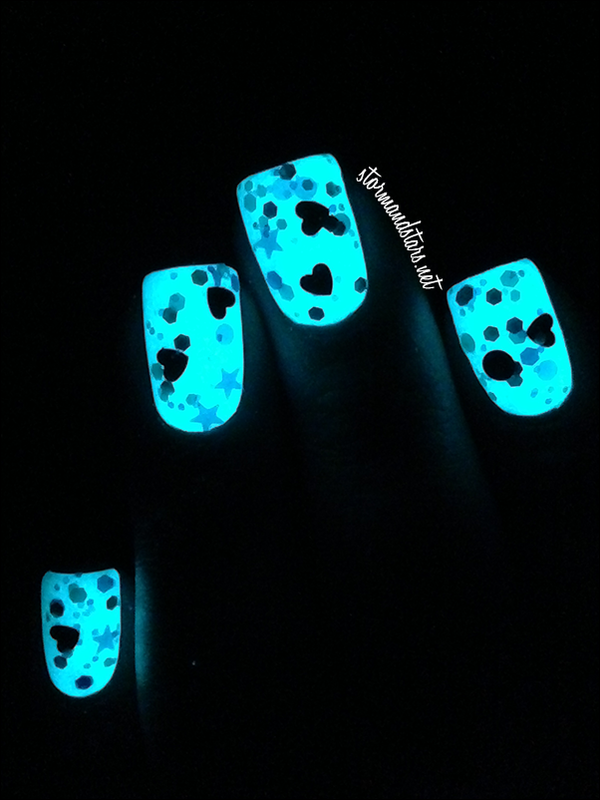 Oh Cool Blue just so happens to be a glow polish, so lets see what this beauty does over something glowy! Holy wow! I love this so much. If you buy this lacquer, please do yourself a favor and put it over something that glows. I had so much fun playing in the dark with it. I also wanted to matte this one, so I added a coat of Essie Matte About You to the entire thing, and I loved it even more! 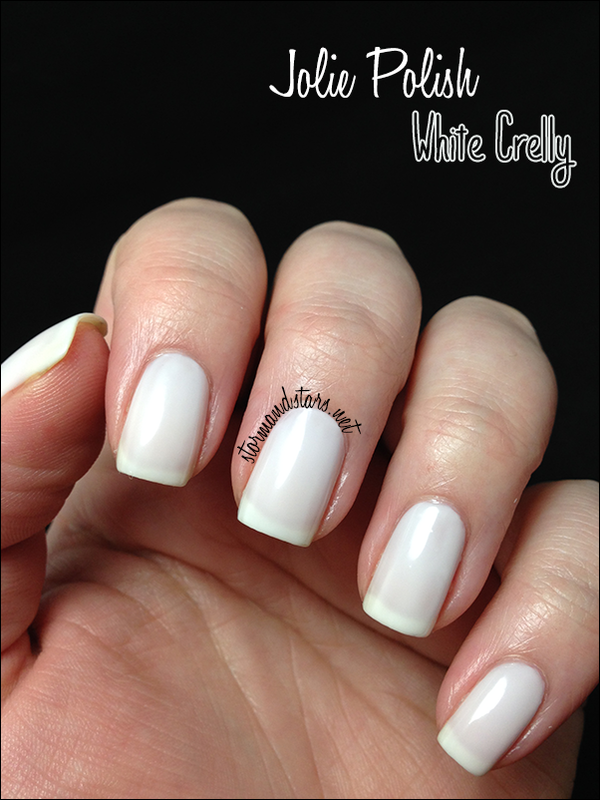 I have a few sheer white or jelly white polishes, and most of them are steaky and goopy and gross. White Crelly is none of those things. 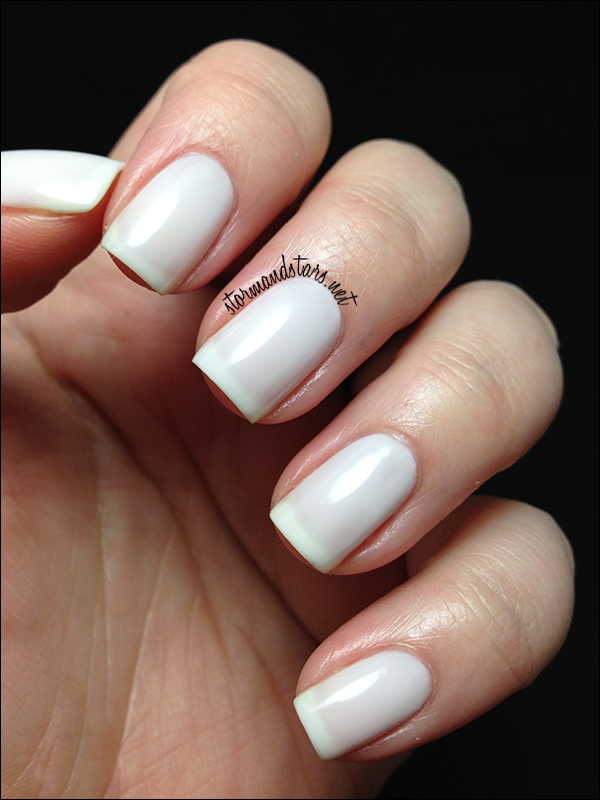 This polish should be a staple in any good nail gal's collection. I will most definitely be buying backups of this for the future. 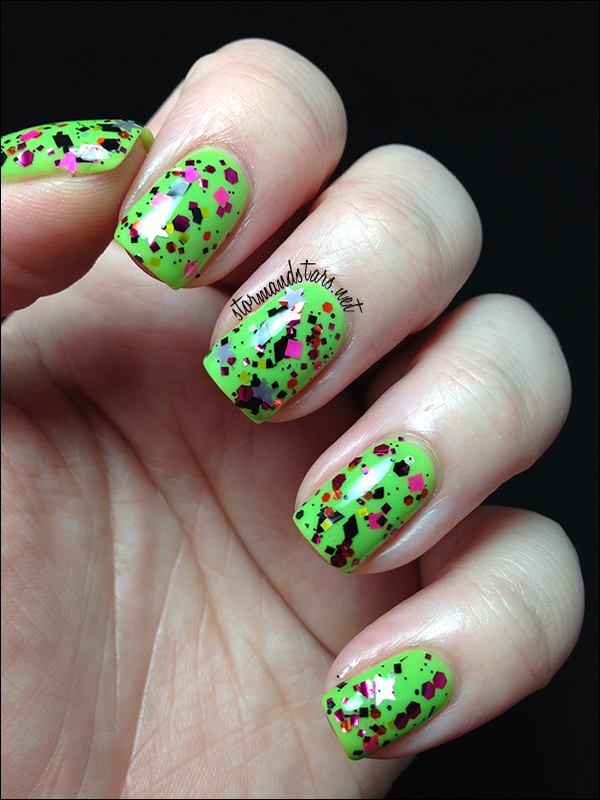 I used two coats here, but you can layer it to the opacity that you want depending on the manicure. It is perfect as a base to any white based glitter polish you have that you don't want to waste. Then you only need one coat of the glitter on top. This also makes a great jelly sandwich. 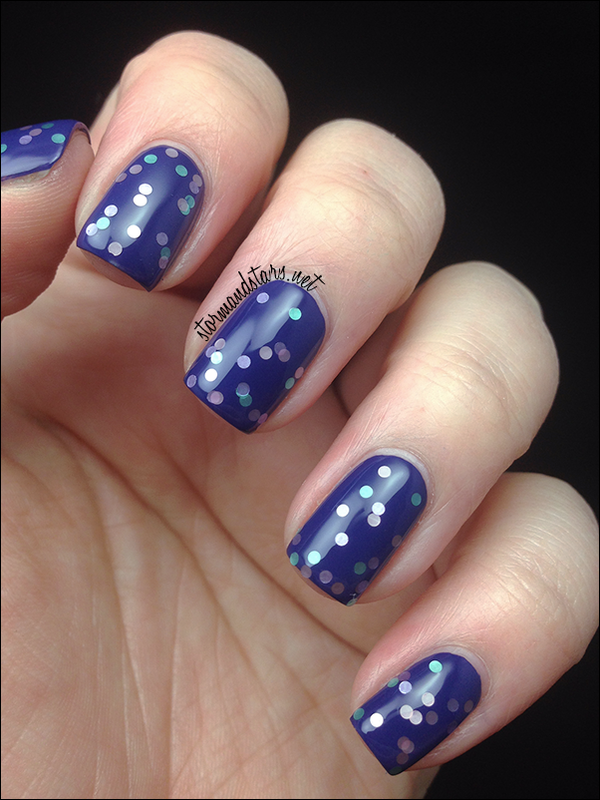 For those of you who are newer, a jelly sandwich is a couple layers of a jelly or crelly polish, a coat of glitter and then another layer of the jelly or crelly on top. 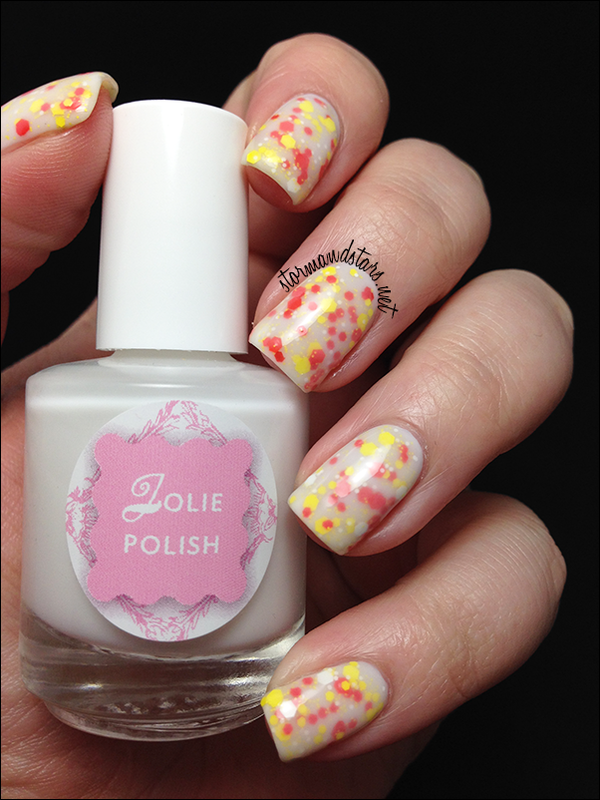 Below I used a coat of Liquid Sky Lacquer - Candy Corn in a jelly sandwich with White Crelly. Because it is white, you could easily pair this with hundreds of different glitters and it would look amazing with them all. The final of this collection is one that I wasn't expecting to like as much as I did. Here is The Rockin' Mermaid. Can I just tell you how much I love the pink squares??? I love them love them love them. 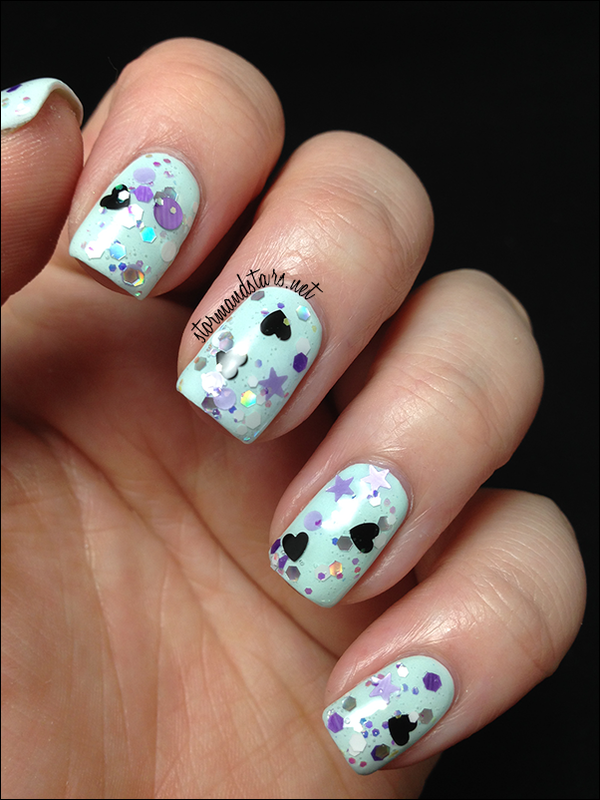 I need a polish with lots of pink squares and black stars and hearts. Someone make that happen please? Haha! There are stars in here too, but they didn't photo well. There is just so much going on. This baby is named perfectly. 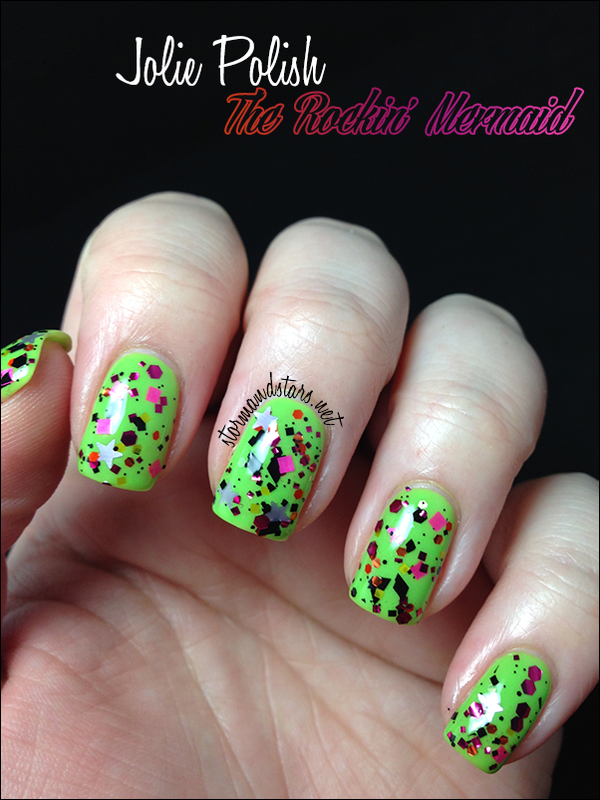 I used two coats of The Rockin' Mermaid over Wet N Wild - Stand The Test Of Lime for these photos. I added Seche Vite topcoat to smooth it all out and make it super shiny! So what do you think? Do any of these stand out to you? My absolute must haves from this group are White Crelly and The Heart-Breaking Mermaid closely followed by The Rockin' Mermaid. The first two are my personal faves. These are really nice! these are beautiful! that mermaid one with the black hearts and white crelly are going to my wishlist!